It is the year 1921: Albert Bernhard Jürgens founds the first generation of the company in Emsdetten – starting out with a small trading company for wooden clogs. There was a brisk trade in Jürgens’ clogs in Münsterland and across the border at that time. In the course of this era of industrialisation the company founder expanded his business together with just a few employees to include the manufacture of turning, milling and copying machines, which he used for the mechanical production of the clogs. 1947: The second world war is over, fresh starts are on the agenda – and the foundation stone of the present company was also laid in Lönsstraße 15 in Emsdetten. A new main pillar was added to the manufacture of wooden clog machines – the development and production of mechanical looms for the widely spread jute industry in the region. Heavy duty looms for the production of sisal and coco fabrics were added to the product range of Jürgens. Until the early 70s these weaving machines were the core business of the Jürgens machine shop, that had in the meantime begun to operate globally. Right up to the present day Jürgens has remained one of the three leading global manufacturers of special looms, which are used primarily in the manufacture of sophisticated fabrics for paper production. Jürgens has focussed its expertise here on the development of forming, felt and dryer fabric looms ( JP 2000 / Model II / Model TF). It is now possible to install between 10 and 15 machines of this type a year, with widths of 8 to 30 meters and often weighing anything up to 80 tons. Albert Hubert Jürgens, the oldest son of the founder, joins the company in the year 1954. Turbulent years of growth alternate with more difficult times. A pioneering achievement of this time is the development and launch of ferric ductile cast iron production in the as-cast state without any annealing facility – the first foundry in the Federal Republic of Germany to do this. Product development in machine construction resulting in the heavy duty looms of today is another feather in the cap of the successor. Under his leadership, characterised by his sense of social and entrepreneurial responsibility for employees and companies alike, the company develops to become a major and reputable supplier, even on an international level. Albert Hubert Jürgens is completely committed to carrying on the tradition of the family business - and he does so in a classically exemplary manner. The day-to-day business of the foundry and machine shop is today in the hands of the third generation – Albert Andreas Jürgens, the oldest son of Alber Hubert Jürgens. He joins the firm in the year 1989 after successfully concluding a toolmaker apprenticeship, gaining a mechanical engineering qualification and spending a few years gaining professional experience outside of the firm. He took over responsibility for large areas of operational management very early on. He has been the sole associate and managing director of the company since 01.01.2002. Albert Hubert Jürgens became Chairman of the Supervisory board at the same time, a position that allows him to continue supporting the development of the company. The long-term corporate goal is to expand the fields of business even further so they remain competitive and efficient – and to continue with the fundamental independence of the company Jürgens as a medium-sized enterprise. Jürgens supplies packaging line no. 100! End customer St. Gobain Brasil. Jürgens supplies the first stretching frame with heat setting (Infrared) for the PMC market, for online process directly after the weaving loom. Successful commissioning of the newly developed JP-4000 projectile loom.6 m with 230 picks / min. Another new record. 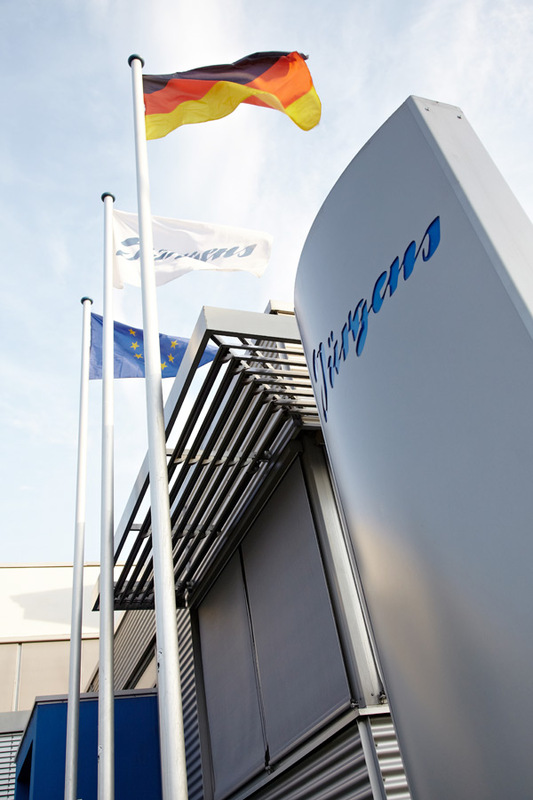 Jürgens supplies via Karl Mayer the worldwide first tandem beamer for the paper machine clothing market. 2 canisters at the same time with 250 m / min warping speed. Plus: Via Karl Mayer Jürgens supplies the world’s first tandem beamer for the paper machine clothing market. 2 warp beam drums simultaneously with a warping speed of 250 m / min. Successful launch of the JP-5000 projectile loom – the next generation of wide weaving looms for forming fabrics – the fastest looms in the PMC world.10 m with 130 picks / min. Cooperation with Karl Mayer from Obertshausen. Jürgens receives the right to represent and to sell beamers and creels from Karl Mayer worldwide, exclusively for the paper machine clothing market. Jürgens supplies the widest shuttle loom in the world measuring 33.15 m. A world record, registered in the Guinness Book of World Records. Plus:Foundation of the Holding - Jürgens GmbH & Co – with Albert Andreas Jürgens as sole associate and managing director. Entry into the packaging and automation business. Automatic packaging machines for the gypsum, film and nonwoven industry. Conversion of the first HP200 loom manufactured by our competitors to a band rapier and new loom control. Albert Andreas Jürgens becomes the sole associate and managing director of Jürgens. Delivery of the first Jürgens band rapier loom. The first wide weaving loom (14 m) for paper machine clothing is supplied to the company Heimbach in Düren. Shuttle weaving technology. Jürgens is the first foundry in the Federal Republic of Germany to develop and start production of ferritic ductile cast iron without any annealing facility. 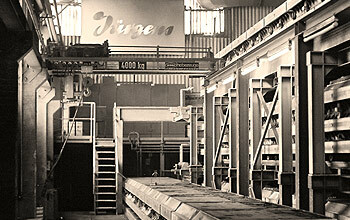 Foundation of the Jürgens Foundry – production of grey cast iron. Production of the first heavy duty looms for weaving jute, coco and sisal. Carpet looms were added later and remained the core business of the machine shop until the 70s. 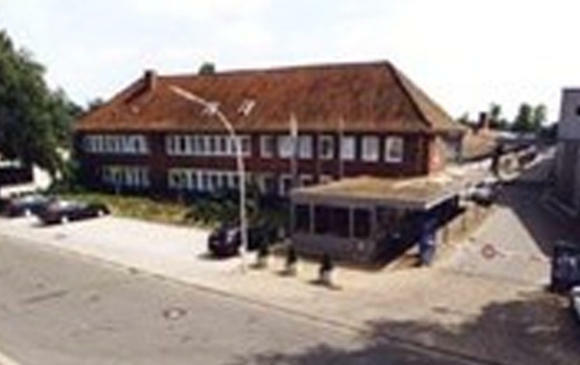 Plus: Move to the present company premises in the Lönstraße. During the Second World War – manufacture of spare parts for the local textile industry – for the production of jute and sisal fabrics. Manufacture and sale of copying and milling machines for the production of wooden clogs. Founding of the company by Albert Bernhard Jürgens (1st generation) - trading in pans, basket-weave goods and wooden clogs.